Steve's Free | Chains really didn't work for me. Paul the apostle – who was Saul the persecutor of Christians before he was converted through an encounter with Jesus Christ – was a brilliant fellow. He was one of the zealous, principled young Jewish leaders of the Pharisee sect. And he was no fan of this new movement preaching a dead, but resurrected, Messiah figure named Jesus. The Jews, after all, were the chosen people – God’s favored nation. The gentiles on the outside were viewed – there’s no delicate way to say this – as dogs. Un-believers, un-chosen, unclean, and inferior. Then there were those half-breed Samaritans in the north, rife with idolatry and definitely on the outs from the presence of a holy God. And, of course, any heretical sect from within the nation of Israel – like these Jesus-followers – needed to be extinguished. Paul was very much into being RIGHT, being BETTER; until God showed him how wrong he was. How he was, in fact, no better than any of these other people groups. How he was, in reality, no better than the lowest, despised, apostate sinner. There could hardly be a more radical declaration in all of religious history than this one. God is giving a righteousness (a right standing before Him, with all guilt removed) to people totally apart from their performance of any law. This gift is received by faith only – not by any obedience, any conformity, any external religious acts. We can’t earn a drop of righteousness before God. This righteousness is equally given to any and all persons equally (there is no distinction) – not matter if they are Jews, Gentiles, Samaritans, Asians, Africans, men, women, old, young, priests, prostitutes, actors, IRS employees, Republicans, Democrats, cultural Christians, murderers, Cowboy fans…even Canadians. God’s favored people are no longer a physical nation with a physical descendancy from Abraham. God’s people are simply any and all who believe. Everywhere. In any circumstance. This leveling gospel of the gift of righteousness is true because all people are equally sinful (all have sinned and fall short of the glory of God). No matter how good or how bad you think you’ve been, the testimony of God is that we are all impure – from the most outwardly religious, to the most aggressive atheist, to the most devoted mother, to the most indifferent pseudo-christian. From Billy Graham to Christopher Hitchens – and every single person in between, from every tribe and tongue and nation and creed – we all have the same affliction: a rebellious, unbelieving, and impure heart. You and I, whomever you are, and whatever you’ve done or not done – we are on the same level. We have the same need – being made right with God because of sin. And God has provided the one Savior who has made the gift of righteousness available to all who believe – Jesus Christ. Next time you or I are tempted to feel superior to anyone on this planet, it is only because of the delusion of sin, whispering in our ear that somehow we have attained a righteousness of our own. Trust me – you got nothing. Neither do I. An imparted righteousness that comes from God Himself makes us all level, where we belong. In need of a Savior. In the middle chapters of John’s gospel, which I’ve been reading through lately, the rabbi Jesus comes into increasing conflict with the Jewish leaders of His day. But He’s also making claims about being “one with the Father,” and this type of Messianic deity statement is definitely not going down well. You see, the scholars and leaders of the time were looking for a different kind of Messiah than what they were seeing in Jesus. He didn’t fit their portrait. He wasn’t the Expected One they were expecting. And, here’s the thing – they were half-right. They were looking for a conquering King, not a suffering Servant. They were looking for a Liberator of Israel, not a Savior of the whole world. The Messianic prophecies of the Scriptures spoke of both; but the Jews at that time were expecting one “coming” of the Messiah to free the nation from Roman rule and usher in the new age. Jesus was talking about two comings, which wasn’t fitting the expected messianic mold. One appearance, as a sacrificial savior to be lifted up, not on a throne, but on a cross. Then, having poured out the gospel of grace to the entire human race, a second coming (as conquering King) that would usher in the rule of God on earth, and the defeat of all enemies. The contemporaries of Jesus weren’t stupid – they were studious. They simply didn’t see the whole picture clearly – they had it half-right. Prophecy isn’t as simple as schoolboy math. There is enough clarity+obscurity in the Old Testament, and the New, to keep scholars busy for generations, seeking to understand God’s ways. That’s why we need to maintain a spirit of humility in our ability to interpret truth. God has made Himself abundantly clear in the Bible regarding His reality, the pervasiveness of our sin, the astonishing offer of His gracious forgiveness, and our need for repentance and faith. We have no excuse for denying the basics. But although God is true, and His Word is true, we still have a limited capacity to get it “right.” Because truth is not just propositional. It is moral. 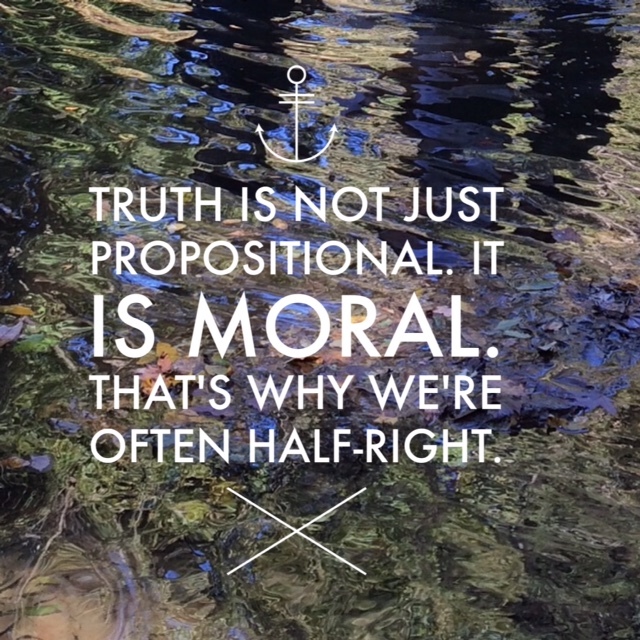 That’s why we’re often half-right. Individually and as an entire race, we are laced through with immorality that clouds our eyes and minds. I don’t know where I would be without the influence of others who see certain non-essentials differently than I do. I need the wisdom, reasoning, and apologetics of CS Lewis, though his take on some of the finer points of theology are different than mine. I need the preaching and charisma of Charles Spurgeon, though his view of baptism is different than mine. I need the Kingdom vision of NT Wright and the theology of Jonathan Edwards, though their views on church government are different than mine. I need the passion and prophetic courage of Martin Luther King, Jr., the cultural intelligence of Soong Chan Rah, and the Confessions of Saint Augustine, though their ethnicities are different than mine. I need the reconciliation spirit of Miroslav Volf, though his nationality is different than mine. I need the spiritual thirst and love impulse of Brennan Manning and the prophetic wit of GK Chesterton, though both were Roman Catholics and I am a Protestant. I need the hymns and personal holiness of John and Charles Wesley, though some of our doctrinal distinctives are different. By all means, we should have firm convictions about what is clear. We should seek to be as accurate as we can be about matters of truth. But join that to a proud heart and we’ll simply end up with another myopic breed of half-right Phariseeism. Lord, help me to rejoice today that You (alone) are ALL right while I remain half-right, and give me contentedness that eventually – at that second coming – you will make all things right (even morally myopic me). Broken, blind, defiled, and in denial. These are the labels we wear outside of Christ. And, as long as we remain in denial, we vehemently deny it. Doesn’t change a thing. We’re broken. Blind. Defiled. And trying to cover it all up with denial-fig-leaves. Until God puts a spiritual mirror in front of us and gives us a glimpse of reality. Yes, God makes us miserable – or, to put a finer point on it, God exposes our awful misery while shaking us out of our senselessness. Ironically, it is the recognition of our hopeless moral sickness that leads us to the Savior. Jesus was well known for many things. His compassion. His healing power. His wisdom. But He was also a rule-breaker. Not just those man-made rules, mind you. He purposefully violated natural laws. Again and again. You just don’t heal a virulent disease like leprosy with a touch. But, Jesus did. Giving sight to someone born blind? Not possible. Jesus did that, too. Raising the dead? Definitely against the rules. Of course, that didn’t stop Jesus. 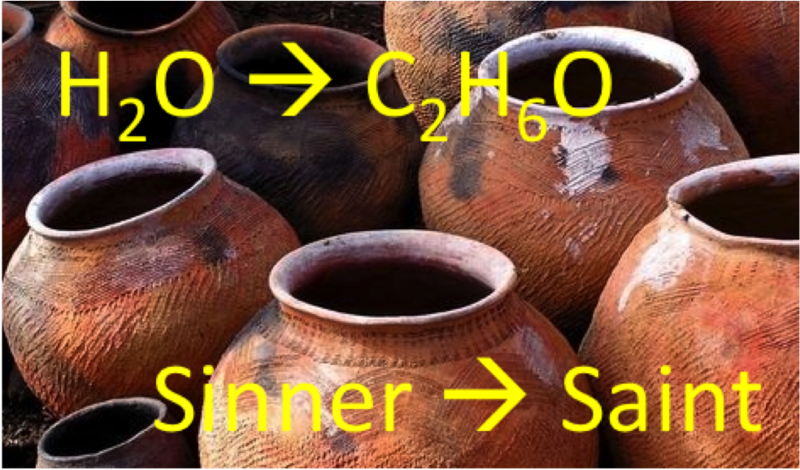 Or, as I was reading this morning in the gospel of John (chapter 2), taking six large waterpots full of water and transforming them into wine for a wedding celebration in the town of Cana. Not cheap swill, mind you. The good stuff. Cana Cabernet. Hundreds of people witnessed His miraculous works. Even His enemies couldn’t deny them. According to the rules, we just can’t do this supernatural stuff. I’ll probably swing by the pool in our housing development today while walking the dog, and I guarantee you, no matter how vigorously I wave my arms and how loudly I chant some magical incantations, that H2O isn’t becoming anything but pool water. I might entertain the neighbors, however. I’m subject to the Rules. Natural law. Science. Only Someone ABOVE natural law can break these rules. The One who rules nature itself can override natural law and do supernatural things. And when it comes bringing life out of death, that is the main point of Jesus’ gospel. Being “born again” is experiencing rule-breaking, live-giving, supernatural re-birth. The gospel of hope is for the dead and the guilty and the powerless. He takes the plain, tasteless, even polluted water of my soul and pours in the wine of His grace. He opens spiritually-blinded eyes. Transforms a sinner into a worshiper. When God makes a Christian, He breaks all the rules. There is no such thing as a “natural” Christian. Where Christ is, there is super-natural life. 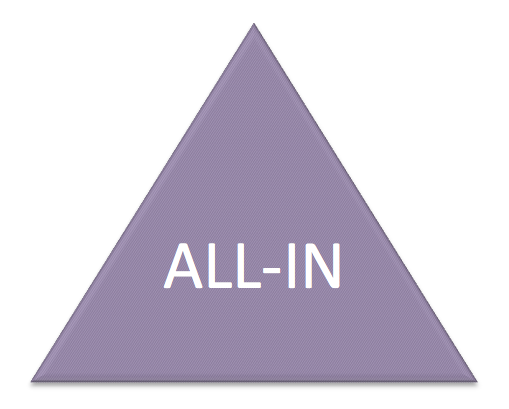 When it comes to our salvation, one of the most comforting thoughts is that God is “all-in.” Some people imagine (much to their needless worry) that somehow Jesus is convincing a reluctant Father to do a big favor and be nice to sinners; or that the work of the Son and the Spirit are somehow disconnected and perhaps even at cross-purposes; but all such unworthy notions should be put away when we read the testimony of the Scriptures. 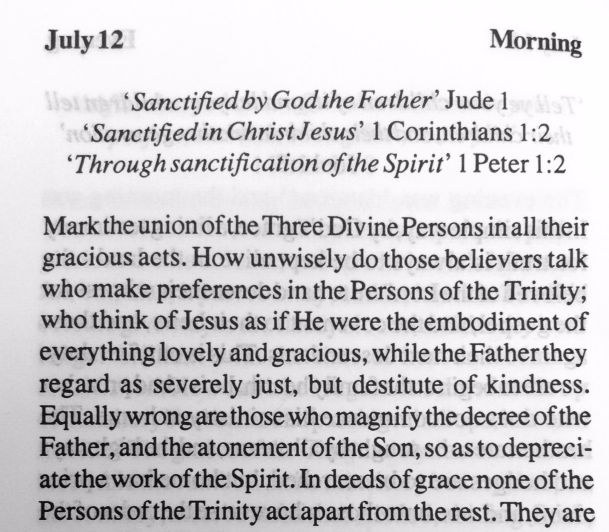 The mystery of the Triune God of the Bible is great – and anyone who claims to have wrapped their head around the depths of the essence of the One-God-Three-Persons of the Christian faith is either a genius of the highest order, or else delusional (I vote for the latter). But that doesn’t stop us from affirming, as Charles Spurgeon does above, the clear teaching of the New Testament: that God is united in His love, His intentions, and His work. God’s purpose is one – and He is all-in on our salvation. We are sanctified (progressively purified and made holy) by, in, and through the single purpose and all-in activity of the living God – Father, Son, and Spirit. Today, we may feel spiritually dead. We may have defiled ourselves through some indulgence of sin last night. We may be filled (again) with doubts and anxieties. We may even feel like opting-out. Has any of this changed God? Not a bit. His eternal purpose remains steadfast; His love is unfailing and unchanging. When God gives a covenant promise, it is not up for negotiation or renewal. His purposes are a cord of three strands, which cannot be broken. All things are of Him and from Him, and He will bring all of His redemptive work to completion. Our hope is not in a “part” of a fragmented or fickle God – it is in all of God, who is all-in. Why do so many of us have very conflicted reactions to social and political developments in our country? The turmoil we’ve been through as a nation over the past few weeks (racist shooting; flags; Supreme Court rulings) has brought it all to the surface in a new way for me. You see, I am one person; but, like every one of us, I view life, and live it out, through two lenses. One the one hand, _____________. On the other, ___________________. >> I have a personal worldview, and those beliefs lead me to think and speak and act one way. >> I am a citizen of the United States, and that reality also shapes my feelings and actions into certain (other) directions. Here’s an example. Let’s say I’m out walking my dog and you come up from behind and stab me – you stinking coward, you. Couldn’t even face me. I hope Mystic rips into your leg. Anyway, as a person, I may have a reaction of anger, perhaps to the point of desiring vengeance. I (and my rather imposing sons) may want to pound you into oblivion. Hopefully, I get some sense talked into me, and, eventually, I am even brought to the point of extending forgiveness. All of those feelings and reactions go on at the personal level. What I am NOT allowed to do, however, is mix the personal with that which is at the societal level. That is, as a citizen of Franklin, TN, USA, I have to embrace the rule of law and let societal justice take its course with you, even if I still want to rip your head off – or choose to forgive you. As an individual, I may wish you well; but as a citizen, I may feel the tug of a certain double-mindedness about also wanting justice done. And it doesn’t matter how you or I feel about racial heritage. I can’t enlist any sense of bigotry into the application of law. That is all out of my hands, and must be handled impartially by the government. Do you see the two layers here? They produce different responses. The teachings of Jesus inform me what to do on a personal level. But they aren’t to be applied one-for-one to our citizen/state relationships. <—(look, if you get nothing else out of this too-long essay, get this point. So much ill-informed Bible-verse-abuse happens by people trying to take the Bible’s principles addressed to individuals and the church, and applying it to the state. Judge not? Love your neighbor? Forgive? -these are not addressed to the state, but to the people of God). That’s why I often find myself with layered reactions…because my response to things on a personal level may be quite different from my response as a citizen of this country. Hence, I think and speak with two voices at times. Let’s take, as an example, the ongoing movement toward obliterating moral (and societal) categories of gender and sexual expression. As a Christian individual, dealing with individuals who may not share my beliefs, it is my role (before God) to love all of my neighbors. That means I am to treat members of the LGBT community with kindness, respect, and open-heartedness; affirming not only our shared human fallenness, but also our shared human dignity. I may not wish to participate in, or affirm, specific beliefs and practices that I believe are contrary to the will of God (as is my right and duty); but that does not give me license to hate others whose sin happens to be of a different shade than mine. Jesus is our personal example – He welcomed fallen sinners of every stripe. My Facebook stream was lit up last week with rainbow-colored avatars. I have many friends and colleagues who have a worldview different from mine. That’s not an accident – it’s a choice. I choose, as an individual, to build relationships with a myriad of people of many different backgrounds. Also, I am not to try to impose my beliefs upon other individuals through coercion. Dialogue and persuasion, yes – that is the essence of freedom of speech and religion in a civil society. Coercion, no. I can vote my values (including moral perspectives), just as every other individual citizen can and will, but I cannot impose religious practices on others – just as I don’t want others to impose on my religious beliefs and practices. And, the larger Christian community (the church worldwide, and individual churches everywhere), is to have a similar posture. We are to love our neighbors and welcome them to Christ, who cleanses each member of His community. We speak what we believe God has spoken, without fear – but it is not our job, as a church, to impose a theocracy onto our community through government coercion. The church may speak to, but it may not govern, society. This is not the place for Sharia law. May I put it more bluntly? A church-controlled government would be anti-American. Why do you think our founders fled to this land? HOWEVER…I am not only an individual with a personal worldview, I’m also a citizen of a nation founded on freedom of speech and freedom of religion, and here is where a “double-mindedness” comes in for many of our fellow Americans. There are individuals who have a different take on gender and sexuality (the roots of this movement, from a societal perspective, reach firmly back into the cultural revolution that took place in the 1960’s). Cultural mores are shifting. Some would say this is progress, others would say exactly the opposite. We can agree to disagree. But when a 2-3% minority can, fueled by the megaphones of the media and education complex, and backed by courts who have abandoned the Rule of Law in favor of Fiat by Opinion, impose its will on an entire nation – well, that’s a threat. Not merely a threat to individuals (though it is), and churches (though it is), but it’s a threat to our freedom, our heritage, as a nation. This ruling – mark my words – will lead to suppression of free speech and free exercise of religion. To everyone’s loss. The mask of “equality” will soon drop off, and the aggressive marginalization of those who believe in objective truth and morality will accelerate. Don’t even try to argue with me. Just watch. So – I can speak kindly with my neighbor, but does that mean I must feel kindly about an agenda that I believe, as a citizen of a free country, is unhealthy and destructive? Am I guilty of “hate” for having a conscience and a less-popular worldview? Freedom does not mean eliminating opposition with court-issued clubs. We call that tyranny. Thousands bled and died for our freedoms. And when their blood flowed on the battlefield, it wasn’t so that bakers would be forced to compromise their sincerely-held convictions, then be penalized and silenced by a court order. I resist imposed immorality and gag orders as a United States citizen, just as I (or an atheist) would resist a theocracy. I can love individual people and communities who are different from me, without embracing culture-cleansing agendas. Many moderate people of a liberal persuasion actually understand the looming issue of religious suppression just now breaking on our shores. They may prefer live-and-let-live – but unfortunately, the tyrannical agenda is always driven by those on the extreme. Just ask the Muslim world. Today’s minority can be tomorrow’s majority, and vice-versa. Yesterday’s oppressed can be today’s oppressors. Demeaning and dehumanizing other citizens by broad-brushing them (as individuals or groups) with labels like “bigot” or “hater” is nothing other than xenophobia dressed up in a new shade of hypocrisy. Have we really made progress, when an active suppression of those who believe differently from the new “in” group – nowadays, an imposition of secular values and practices, imposed by court strictures – is de rigeur in our society? The seeds of moral relativism planted in the ’60’s have come to full flower. We are moving, progressively (pun intended), into the anarchy that leads inevitably to tyranny. As an individual, and as a citizen, I get to love my neighbors AND speak my mind, even when there is more than one layer to these things. What you see above is civil discourse based on sincerely-held convictions. If you think it’s hate speech, then you, my friend, are part of the problem. You may want to check your tyranny at the door. We’ve been surrounded all week by talk about equality. The hateful shooting in a Charleston S.C. church has brought to the surface the enduring existence of racist thinking in the minds of some; though it has also brought to the fore the remarkable response of forgiveness from many of the families impacted. This was a hate event that turned into a grace event. In light of that, what does the Christian gospel have to say about race relations? May I give a little bit of context for this remarkable, we’re-all-on-the-same-level passage? The Christian message came into a time and place where the Israelites – the physical descendants of Abraham – were “the chosen race.” This was nothing inherent – they did not possess superior humanity – but it was strictly through the election of God. God was “with” Israel – and everyone else was an outsider. Gentiles were dogs. Samaritans (half-breed Jews) were despised. The sense of superiority was both tribal and religious. That was the reality; and throughout human history, from the ancient past to the current day, you’ll never find a time when people of varying tribes, races, cultures, and belief systems did not look down upon, make war with, and subjugate others. Tribal strife in the Middle East is nothing new. Slavery, ethnic cleansing, oppression – where and when have these ugly practices NOT occurred?? We are a fallen HUMAN race; prideful superiority is woven into the fabric of our corrupted hearts. Not a single reader of this post is free from it – nor is the writer. But into this mess came the radical message of the gospel of Christ. All humanity had already been levelled under the dominion of sin. But the divine announcement of the Christian faith was that ANY and ALL could have equal standing with God based strictly on believing in the emancipation proclamation of Jesus as Savior. Jews and Gentiles; slaves and free; men and women; all races, backgrounds, cultures, standings in life, genders; even all stained with every variety of moral shortcoming and rebellion – ALL are welcome to turn from sin and come to Jesus, and be granted the status of spiritual offspring of Abraham. Chosen ones. Equally fallen, equally forgiven, equally adopted – equal in status before God and one another. The body of Christ is one, composed of many. Different, yes. United in a common humanity and salvation? YES. From the richest to the poorest, all robed in one righteousness, one faith, one hope. Jesus Himself. We retain our racial and cultural and other differences, of course; but all pride in such distinctions is obliterated. This is why racism is so wrong; and this is how it is overcome. Apart from the gospel, racism is a fact of life. In Christ, racism must bow to a salvation that levels every human being before an infinite and wise God. You have to drop your superiority when you humble yourself before the living God. Love wins, in other words. And the amazing-grace response of the people of Charleston demonstrates that fact. Forgiveness, in the face of such hurtful hatred? It is the grace of God at work – so eloquently described by President Obama in that city’s memorial service this week. Equality is rooted in eternity. When we personally know God’s embrace of our unworthy souls, we will fully grasp that we are all equal; and then, in humility and gratitude, we will embrace one another.